Q. Who is STEWART ELECTRONICS? Since 1976 our third generation family business has been in the Electronics Industry. We own an alarm systems installation company and a line of automated lighting products known as ALC lighting (which we manufacture in the USA). 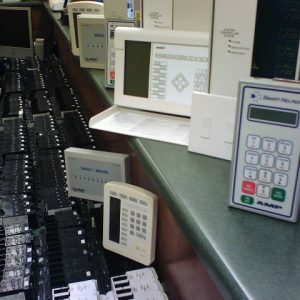 We also owned “Automation University” where we trained hundreds of home automation dealerships. We have been in a variety of home automation related businesses since the days of the very first automated homes beginning when 3 of the members of our family business graduated from the very first Certified Smarthouse Dealer program in 1993. Since then almost every other Smarthouse dealer from that time has moved on and abandoned this technology. The good news for owners of Smarthouses is that since we started installing Smarthouse systems in the early 90’s we are still in the business. However, the Smarthouse system has been out of production since 1995 and the manufacturers of the parts no longer make or support these systems or parts. So, our efforts have shifted to that of a support resource for those of you with one of these Smarthouse systems installed in your home. In addition to installing systems from 1993 to 2002 we have also worked as consultant for the Smarthouse manufacturers and traveled to problem installs all across North America to support repairs. In 2002 our family business purchased a warehouse full of the remaining spare parts for Smarthouse systems from these manufacturers. Accordingly we can supply spare parts for your AMP or MOLEX brand of Smarthouse and also other parts from the other Smarthouse certified manufacturers. However since 2002 we more often work towards removing the obsolescence of Smarthouse systems by using the existing cabling in your home to convert your Smarthouse to current technology. You can certainly order replacement parts from this website that are still in the new boxes or even some less expensive used parts. Just remember that these parts are still obsolete! When you bought your Smarthouse it was state of the art (if you are the original owner). The wiring inside your walls is useful and DOES NOT need to be changed. It’s the electronics that use those wires that are obsolete! No matter what problems your Smarthouse has, we can offer parts, service and consulting for your location as needed. We can also work with your local contractor to facilitate the repair or a conversion (best option). Q. Have other Smarthouse owners used your services? Oh yes! In the 1990’s when Smarthouse was still a current product it was promoted by the National Association of Home Builders as the “Home of the Future”. Many systems were sold. Most of which started as a show home for selected cities. These show homes were loaded with over the top automation features and benefits. After the initial promotion of each of these “Model Homes” they were sold to homeowners like you. But most of the features used in the “Show Home” were removed by the manufactures leaving many homes with nothing but a complicated lighting system that is now obsolete! Due to the cost of these systems they were initially sold mostly to the wealthy and famous. Accordingly we have consulted with Rock Stars, Nascar Drivers, Professional Athletes, Musicians and millionaires. Later as these homes were resold many of them hit the sold at far below market value due to the fear of technology and later because of the obsolescence. Our conversion program has helped Smarthouse owners to maintain much of their homes resale value. We can certainly provide you with a list of references that would be happy to share their stories with you and also will speak of our value as a resource. Q. 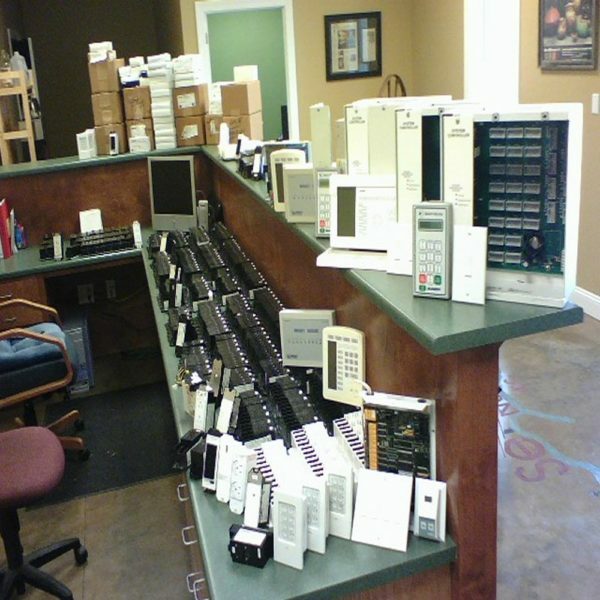 Is Stewart Electronics still installing Home Automation Systems today? Yes. But of course we install the latest generation of systems including “Connected Home” systems that sell for hundreds of dollars instead of hundreds of thousands of dollars. Can we still install a high end system today? Yes, but the market has changed to the point to where an install is no longer only for the wealthy. Instead first time homeowners can afford a complete system. We are licensed to install and service systems in South Carolina but also travel to consult with homeowners with problem installations or with licensed contractors in any state. Sadly even with entry level systems far too many homeowners have experienced problems and can’t find local support for their products. Q. How do I know that Stewart Electronics will be around in the future to support my system? We are a 3rd generation family business today. And we have depth. When working with customers inside and outside of South Carolina our mission has always been to leave our customers with the ability to support their systems using local talent and with parts that are not obsolete! Better yet, we believe in “Open Architecture” products. Open Architecture means that the products in your home can be replaced with a variety of manufactures products and that future products that come on the market can be easily added. Example: You could replace your automated thermostat with one of several brands. And, it today your current thermostat is a standard wired version, you could replace it with a wireless version later that would not require the installation of any new cables! This is also our objective for security, lighting, energy management and all other subsystems in your home. Q. Explain Open Architecture versus Proprietary Systems and which does Stewart Electronics support? From 1993 to 1997 the founder of our Home Automation division Tony Stewart was a founding board member of the Home Automation and Networking Association of America (HANA). Today that association is known as CES Tech Home. During those years the future standards of what would be installed in homes was being debated. Some board members wanted proprietary products like the AMP and MOLEX Smarthouses. Others like Tony promoted “Open Architecture”. The end result is that both strategies exist today. Both strategies have pros and both have cons. Proprietary systems restrict your choice of products and installation/service companies. But as long as the company stays in business future support is a plus. Open Architecture allows you to be free to upgrade, adds new products or select other service companies (without being forced to go with one proprietary brand or dealership). From lessons learned in from the AMP and MOLEX proprietary systems we now focus on open architecture as our pick. We can help owners of modern proprietary systems to convert to open architecture when their product or installing company is no longer available. We also learned that even the largest of companies can abandon their technology and dealer networks. AMP, MOLEX and all of the other Smarthouse support manufacturers devoted over 150 million dollars to that product line only to abandon sales and support within 5 years of launch. So, be careful with your choice of proprietary brands. You could one-day end up with another abandoned system like the one you have now! Q. Are there other locations where I can get Smarthouse parts or service? Maybe! We know of a few of the original installers that still sell parts. Chances are that these parts are “Pulls” (removed from previous installations). To the best of our knowledge we own all the remaining stock of never used Smarthouse parts. But as mentioned earlier purchasing these parts is not wise, instead you should “Convert” your home to a current technology and local contractors. We have consulted on several hundred conversions. Call us to discuss before purchasing parts or services from other sources. Q. With a conversion will I end up with a newer kind of Smart house? Not necessarily. A conversion can include NO AUTOMATION and NO CONTROLLERS at all. This is called a LIGHTING ONLY conversion and is the most requested option. If however you want a fully automated home with your choice of the latest connected home features on the market this too is possible using the wiring in your home as is! We call this option a FULLY AUTOMATED conversion. Q. What is a LIGHTING ONLY conversion? Using your existing wiring the obsolete Smarthouse lighting blocks are replaced with modern light switches that will link to your existing wall switches. The end result is a house full of lights that only work when you press the buttons on the wall switches. Thus “Lighting Only”! With this method you can keep your exiting AMP or MOLEX wall switches to reduce cost. These switches have no obsolete technology and can be repaired easily. We do offer replacements for these wall switches. Of course, this increases your cost so many customers do not feel the need to change out the wall switches. If you choose to replace the wall switches there is another expense. 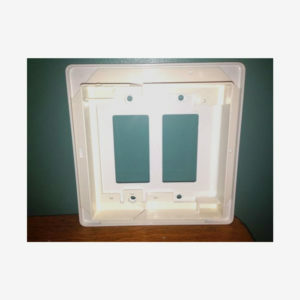 In addition to the cost of replacing wall switches you must purchase one of our oversized wall plate adapters to house the replacement switches as the holes in your walls are bigger than the new replacements. Q. What is a FULLY AUTOMATED conversion? Using your existing wiring the obsolete Smarthouse lighting blocks are replaced with modern light switches that will link to your existing wall switches. It also includes a modern state of the art home automation control system is installed with your choice of “Connect Home” features. This “Fully Automated” conversion can keep your exiting AMP or MOLEX wall switches to reduce cost. These switches have no obsolete technology and can be repaired easily. Q. If I choose the Fully Automated option what are the choices of Home Automation Controls and Light Switches? There are numerous choices. However you must be careful not to end up with a system that could one-day put you in the same obsolete place you are in now. So we always suggest an open architecture home automation system control system with over 30 years of manufacturing history, is backed by a large worldwide corporation and one that has many thousands of installations. Our choice of control system can also be replaced with other competitive brands. While there are other control choices, only two companies meet our requirements. They are HAI Leviton’s line of Omni controls and Elk Product’s line of M1 controls. 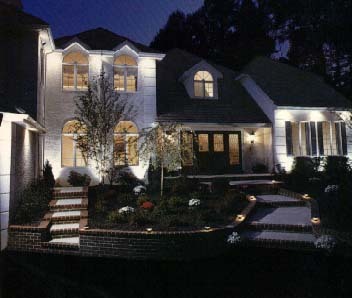 As for the lighting components we suggest our own line of manufactured products known as ALC lighting. Why? To answer that let’s discuss the History of the ALC line of products. In 1994 AMP Building Systems (AMP Smarthouse systems manufacturer) hired our founder Tony Stewart as a product consultant. It was at a time when they were about to offer a way out to their customers who owned their Smarthouse system (which was soon to be become obsolete). The end result of that consulting was the ALC light switch that our family business now manufacturers in the USA. The ALC light switch was created with the conversion process in mind and was also designed to be installed in new homes under construction using standard wiring methods (not proprietary like their Smarthouse wiring). Next, AMP’s electronics Engineer Gary Axe created the ALC lighting line. For the next year AMP Smarthouses were converted using the ALC light switch and our current choice of home automation controllers (our LIGHTING ONLY conversion is a recent variation of this created by us). In 1997 the ALC line began to be sold through electrical distributors worldwide for new home installations. OnQ (now OnQ Legrand) was a “spin off” company from AMP Building systems and sold hundreds of thousands of ALC products until 2009 when they sold the line to our family business. Our first move as the new manufacturer was to relocate manufacturing from China to the USA. That change proved interesting and expensive. We learned why so many manufacturers go overseas. Still, we are pleased with our decision as it allows our family business to better maintain the product flow and upgrades. The end result is that we feel we can support this product for many years into the future. Although there are other choices of lighting products that can be used for your conversion ours is the most suitable at the lowest cost. Q. If I choose another line of products is there any things I should be aware of? First, be sure your choice does not use the wiring inside your walls to carry voltages they are not rated to carry. We are aware of conversions by other contractors that placed devices at the wall switch location that violates electrical codes. Second, be sure that the products used in your conversion DOES NOT require a system controller in order for the lights to operate. For example: Outside of our ALC line, all other products require a home automation controller in order for your lights to work. Should the home automation controller fail or become obsolete, then the lights would not work. Sadly we have seen conversions that ended up with both of the disadvantages. Even worse than this, we have consulted on this type conversion when the contractor that did the initial conversion could not complete it or used product that went obsolete. Q. How do I know the cost of a conversion? Start with giving us a count of the total numbers of lighting circuits controlled by your Smarthouse. See the table for counting devices listed here…..
More topics, conversion brackets-premise versus cluster-war stories, wall switch choices and put them in shopping cart. Pictures of installs & various configs. Glossary of terms. Install graduation picture into first question. Show our installs, in this FAQ, explain our travel requirements, lessen the impact of unknowns for 2nd days on the existing services for ALC pages. Add links to each product mentioned. Q. What role does AMP play today? None! At one time they employed a team of technical personnel to support the Smarthouse installs. All calls to AMP for Smarthouse service or to speak to one of the previous technical staff are routed to us. Q. What is the warranty for AMP Smarthouse parts and systems? All AMP Smarthouse parts and systems are well beyond the warranty coverage period. Q. I want to sell my house. What do I need to know about the Smarthouse Wiring? Plenty! The real estate laws in each state clearly indicate that you must divulge the information that your wiring is obsolete before selling the system. Further, you must advise the prospective buyer the fact that the Smarthouse system can only be maintained by a very few people nationwide (us) and that the parts have been obsolete for over 22 years. There have already been several instances of Smarthouse owners selling their home without divulging this information and then having lawsuits placed against them and/or the real estate firm. In every instance the homeowner was made to pay all costs to convert the house to conventional technology or conventional electrical (which cost them much more than converting to conventional technology). This may come as bad news, but it is good advice to deal with it before trying to sell the home! Q. Are there any programs to replace my current Smarthouse system or to do repairs for free? No! There was a program that ended in 1996 that provided free parts and “conversions” of AMP Smarthouses to a more recent technology at a greatly reduced cost. However, these programs ended in 1999. Today, there are no programs available from AMP of any kind. If you were not included in the conversion program, you may contract us to do this conversion. Or, you can purchase the parts from us and have a local contractor do the conversion. The conversion is pretty simple and a single page drawing is all we need to provide to your contractor. We will be glad to quote this service to you. First, be sure the light bulb is not bad! If the light bulb is OK, then you could have one of several problems. See the next few questions to determine the exact cause of the problem. Q. I have a light switch that feels like it might be broken or is visibly broken. Replacements are available. 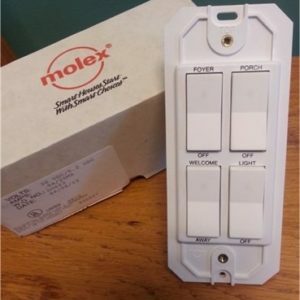 These switches are low voltage and can be replaced without calling a Licensed Electrician. However we advise you to check with a licensed contractor before starting. Solution 2 – If you have a Smarthouse system controller installed, go to the room where it is located and look at the small colored lights on the face of the controller. Green Light – System is OK and chances are the light blocks are all OK. If the light switch is probably the problem. Yellow Light – System in Warning. You could have one or more bad blocks. Removing AC power for a brief period of time may restore your light to full operation. See instructions on removing power listed below. – Or – a Block replacement is most likely fix, but there could be other problems. See discussions about replacing and tickling blocks. Red Light – Major Failure. The entire system is down and any lights that still work from the switch will not be able to run a timed schedule or be operated from a wall mounted LCD keypad or from the Homeview software program. You can also try cycling the power to your Smarthouse System controller. Just be aware that the memory for your current program could be lost when power is removed resulting in a total shut down of your lighting controls. First try to remove the AC power to the system controller and wait a few minutes before restoring it. Next, try to remove the AC power feeding the bad block. If neither of these steps works, you will probably need to replace one or more blocks. Q. How do I know if I have a full Smart House or not? If you have a Smarthouse system controlled installed, then your house is at least partially smart. If no controller is installed, then you probably have a Smart Redi house only. Q. Can I upgrade my Smart Redi house to full Smart? No! Due to the age of your system, we will not be able to provide this service. However, converting to modern technology is certainly possible and recommended! Q. How do I get service for my home? For simple repairs requiring switch changes and/or light block changes, you can normally handle that yourself or get a local licensed contractor to do it for you. We can ship the parts to you and can sell or rent you Smart Helper and/or Smarttech software. Note that unless you use the time/date schedules or LCD keypads for controlling your lights, you may not need the Smart Helper or Smarttech software. For complicated repairs, we may have to visit your location. It is possible for you to change the parts and us to program your house from our location if you rent or purchase the Smarttech software and PC. For Conversions to modern technology, consider our on-site consulting. For Conversions to conventional AC wiring, we offer no help. Good luck! Q. What happens if my Smarthouse Controller fails and I don’t have a copy of my program? It can be reprogrammed, but this may take many hours and quite often we must visit your location to get your system running again. We suggest you purchase a copy of Smarttech technician’s software and backup your current program before it costs it’s too late. Q. Can I replace my system with conventional ac wiring? Not easily! Since your house is wired with low voltage cable, it is very time consuming and expensive to convert the system to conventional AC wiring. Besides that, the switches on the wall are bigger than standard light switches and would require the dry wall to be patched at each location, requiring painting/wallpaper – Messy and expensive! 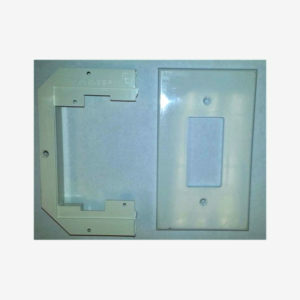 We do have some oversized plates that can be used to convert these opening to accept standard sized switches. However, you will still need to rewire using AC cabling. Call us before attempting this process. Horror stories usually follow an attempt to convert your house to convention AC wiring. Stories of homeowners having to check in to hotels until this work is completed are common. Other stories include tales of huge budget over runs, incomplete work and excessive dry-wall, painting and wall papering work are far too common! It is common that a contractor makes a claim and offers a price to convert your home to conventional wiring only to realize too late that the wiring inside your walls do not work towards his goals. If an electrical contractor does not spend several hours researching you’re wiring and looking inside ALL of your walls where Smarthouse devices are installed DO NOT TRUST HIS QUOTE! Q. If I choose to replace a failed Smarthouse block, is there anything else I need to do for it to work? If on the other hand, you only want the light to come only when you press the wall switch for that light, then you will not need to tickle the block. In some installations, there were multiple locations where a single light could be controlled (multiple light switches). If you require a 3 or 4 way control of the light, then you will need to tickle the block before the other switch locations can control the light. To Tickle or Initialize the block see the discussion on Tickle options. Q. What AMP or MOLEX Smarthouse parts do we repesent? NOTE: AMP & MOLEX smarthouse parts are interchangeable. Q. How do I schedule a visit? Contact us at 1-864-663-0014. Ask for Tony or Anthony Stewart.